Playing Wargames, historical games, we gather here for ideas, informations, propositions about a game, the rules for antiquity and medieval warfare DDA. 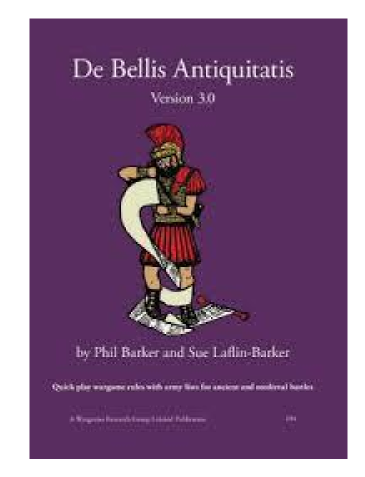 De Bellis Antiquitais had her third version available since september 2014. At the build of this blog, some of us were playing this rules from more than 20 years. – Easy : good access for beginners, easy to learn. – Fast : Less than 1 hour for a game, just a bit more for the first. – Historical : important research form the autors makes possible hundred of army list dispatch from antiquity to middle-ages, giving historical results according about the actual knowledge of History. – Size : In addition with the short time for a game, 12 units for each army cut the cost and the time to paint them. We hope you should find here answer to your questions, help for suround all difficulties you could met when playing this amazing rule ! Of course you change “ourwebsitename” with “dba-va” !